Geologist, Coast Mountain Geological Ltd. 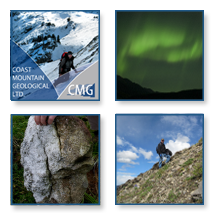 Since 1987 the people at Coast Mountain Geological Ltd. (CMG) have been committed to delivering premium geological services while striving to support the communities in which we operate. We pride ourselves on being a leading and forward thinking geological consulting firm that offers a full range of services and highly diversified International expertise to all aspects of the mineral exploration and geotechnical process. Through our outstanding safety policies, commitment to community work and constant improvement we continue to challenge the boundaries. For over 30 years we have provided worldwide geological services to clients in exploration, energy and mining. Our experienced geologists are equipped to handle a full range of services such as geological, geochemical, geotechnical and geophysical surveying to site based project management, assessment and permitting needs.